We need 4 hugs a day for survival. We need 12 hugs a day for growth. The Reasons we should hug. to express how we feel, and then hugs are the best way to say it. always come from the heart, not from the mind. Come up with new ways of hugging. Give your hugs interesting or funny names. Be always ready to offer a hug to someone. Observe the other person and always be careful of his or her personal space. A hug does and says very much. Wow – what a reply, David! Thanks so much for this, and sending along a hug! I guess I better get out there and get my 12 hugs. I do manage more than 12 on the days I attend church services. The older I get the more I think we need hugs. Received and returned, just as tight! The photo says it all. 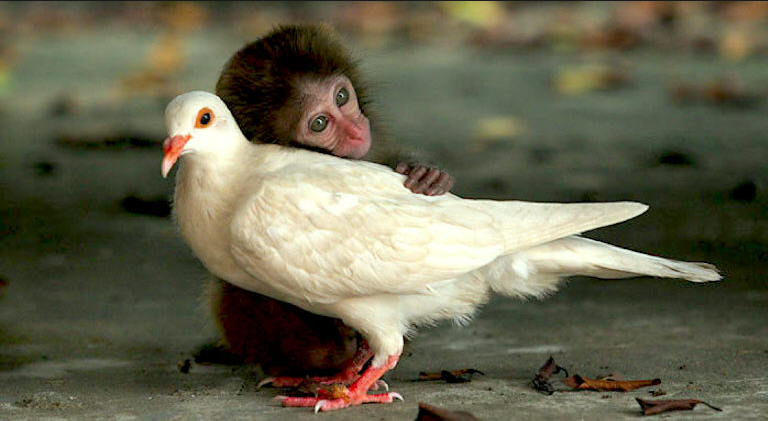 Wonderful example and also shows interspecies connections and love for each other. The photo and the quote were so heartwarming and wonderful. This is such a sweet moment in a hectic day for me! Thanks for this gift! Sending 8 big ones to you, Theresa! Reblogged this on The New Bullying Prevention.